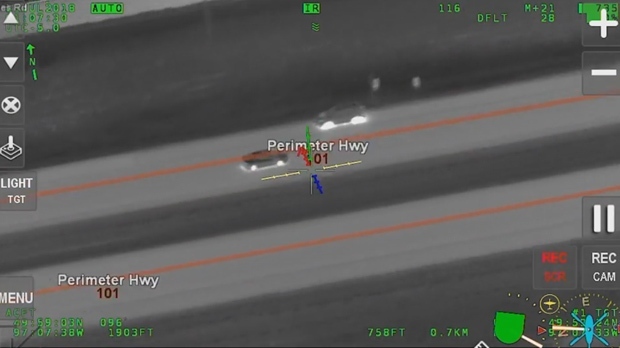 Newly released video footage shows a police helicopter tracking a kidnapping suspect as his vehicle reached speeds of more than 160 km/h on Winnipeg’s streets. The footage was taken early on the morning of July 21, after the vehicle was allegedly seen running a stop sign and otherwise being driven erratically. The video from the helicopter’s tracking system includes audio of communications between the pilot, dispatchers and police officers on the ground. “He’s probably blown at least three red lights and probably two stop signs,” an officer says at one point. The helicopter followed the vehicle as it made its way through the city and onto the Perimeter Highway in the wrong direction. Police say the vehicle topped out at speeds between 160 and 170 km/h. “He’s oncoming. He’s in the westbound lanes on the Perimeter, but going eastbound,” an officer is heard warning. The video shows sparks coming from the vehicle at several points during the helicopter track, which the officers occasionally comment on. The vehicle soon stopped. Its driver ran off the highway and through fields. After about 30 seconds of running, the man is seen falling to the ground. A police officer runs in from another direction and places him under arrest. “Officers have the male, and they also have the vehicle,” one officer relays. “Copy that. Good job, guys,” the dispatcher responds. Police say the man had a female passenger with him who said she had been taken from her home against her will. A 32-year-old Winnipeg man has been charged with kidnapping, forcible confinement, impaired driving, flight from police and other offences. Photo taken from supplied footage of the chase taken from the Winnipeg Police Service helicopter.